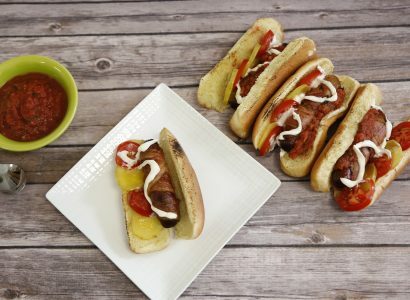 Who doesn’t love bacon wrapped hot dogs? Top them with EVK Salsa for the perfect bite. Wrap 1 piece bacon around beef frank and grill until bacon is crispy, toast bun on grill. Add mayonnaise to bun, add beef frank and put 1 dallop of EVK Medium salsa.